Samsung has a good name all over the world due to its incredible step toward the world of technological advancement. Each Samsung LED TV comes with a new feature through which Samsung easily maintain its good image in the market. Samsung also launched Curved LED TV to compete for its rival and that curved LED TV maintain its position in the market within minimum time. Samsung introduced these curved LED TV in multiple sizes same as a simple LED TV to meet the need of the huge market. The 4K Ultra HD image displayed on curved LED panel to offer a dreamlike experience of the viewers. Its LED Panel ultimately optimize for the ideal quality of picture and allow you to entertain at the best level. The display is the main feature of any Curved LED TV that brings a great change in the Samsung Curved LED TV Price in Pakistan. The visual experience isn't enough to get complete entertainment. The ideal pitch of audio also supports to maximize the level of entertainment. Each model of Samsung LED TV equipped with well-perform speakers that enhancing the value of overall Curved LED TV. Samsung Curved LED TV Price in Pakistan also depends on the feature of particular speakers and fits with a quality of sound. Samsung didn't compromise with the feasibility of entertainment lovers that's why it also contains some port to connect it with other devices same as simple LED TV. You can connect a curved LED TV Panel with several devices and maximize the level of entertainment. It also allows enjoying the wireless environment by allowing to connect other devices through Bluetooth. Samsung Curved LED TV Price in Pakistan depends on it's every single feature and multiple connectivity options also fluctuate its price. In Pakistan, peoples got irritated to spend their time in searching right product and sometimes they did wrong decision due to that irritation. We come up with the solution of that irritation and introduce an online platform that offers a huge variety of qualitative products. We believe in offering high quality and genuine electronic product that isn't easily available in Pakistan. We also introduced a different variety of Samsung Curved LED TV for our Pakistani customers through which they can get the real entertainment as they want. 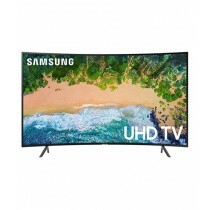 You can purchase any one of them easily without killing your precious time then don't waste a single moment and place an order for your favorite curved LED TV.